Finger is, of course, the writer of the earliest Batman comics, whose contributions to the creation of the Dark Knight include the costume and color scheme, the origin story, the lack of superpowers, the words “Batmobile” and “Gotham City,” Robin, the Joker, and numerous other elements. Unfortunately, due to some legal trickery by his collaborator and actual supervillain Bob Kane, Finger’s never been officially identified with a “Batman created by” credit in any published works or films or other Batman media. 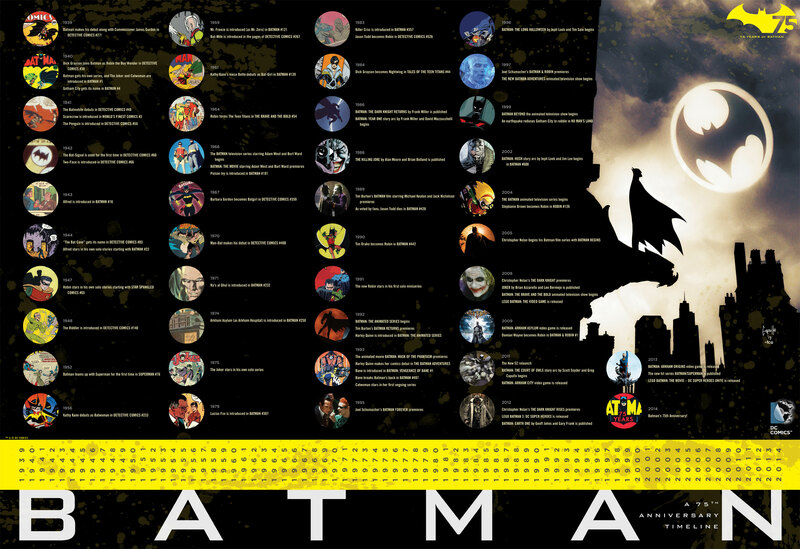 To celebrate Batman’s 75th anniversary, DC has also released a poster that features major events in Bat-history — from 1939 all the way to today. Unfortunately DC currently has no plans to sell the poster, but you may see it hanging at your local comic shop.